Please note that this lesson is being updated with new content. Please contact me if you have any suggestions. 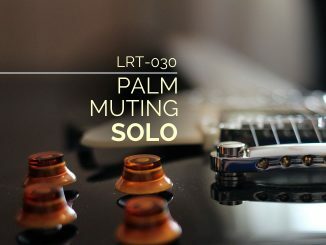 Soloing by Key is the easiest method of soloing because you treat the entire song as one entity. This is done by selecting a scale that works over the entire key and only playing its notes. It really is that simple. Selecting a scale is done by selecting a scale that uses the notes of the key because the chords should also use those notes. Usually, this is the major scale. For example, use the C Major scale for the key of C. You can substitute the major pentatonic scale for the major scale because all its notes are part of the major scale. If you have a minor key, you can use the minor scale or the minor pentatonic scale. For example, use the A minor scale for the key of A minor. If you want more information, I have lessons on the major scale and pentatonic scales on my site and in my book. Now that you have your scale, you can play any note in that scale and it should sound good. The easiest way to do this is by using a known scale pattern. If you don’t know your scale patterns, use the links above to learn more about the major or pentatonic scales. Here are a few tips to help you solo better..
End your phrases on the root note. It will reinforce the key. Listen for the notes that sound best over each chord. Try to play the best notes. Change positions when you play so you play low notes and high notes. It will add interest to your solos. Use dynamics by varying the volume of your playing. Use bends, slides, and vibrato to enhance your solos. Soloing by key works well for beginners, but you will eventually want to use more sophisticated ideas. 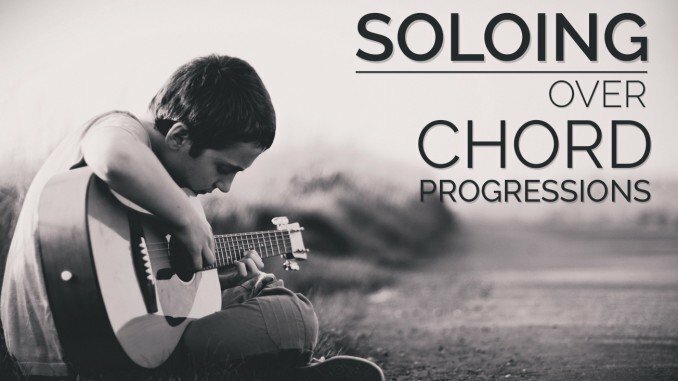 That is why we also study soloing by chord. Keys rarely change within a song, but chords change often. The most interesting soloists change their soloing strategy based on the chord rather than the key. I will explain a few methods that work well for chord soloing. It is hard to go wrong with Pentatonic Scales. They limit themselves to 5 notes that work well over many different chords. The rule is to use Major pentatonic scales over major chords and minor pentatonic scales over minor chords. This works well for most chords. All you need to do is switch scales with the chord changes. 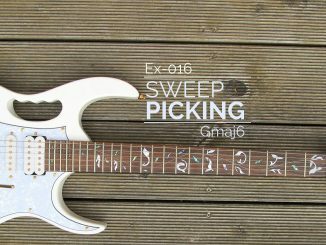 For example, if the progression was Dm7 – G7 – Cmaj7, you could play D minor pentatonic, G major pentatonic, C major pentatonic. You just need to shift the scale and play any note in the scale. Because pentatonic scales only have five notes, they can start to sound boring and repetitive. That is why we use other scales and the modes. Modes are made for soloing over chords. Each mode is able to play over a specific set of chords. If the chord is dominant, like a G7 or G9, you’d want to play the Mixolydian mode. If it is a minor chord, you can play the dorian, phrygian, or aeolian mode. As the chords get more complex, the mode choices go down. Use the chart below to select the best mode for each chord. For more information on the modes, read my lesson on the modes or consider getting a copy of Guitar Lesson World: The Book. Some guitarists solo using chord tones. As the chord changes, you change the notes that you play. Arpeggio patterns are a great way to learn the chord tones. Once you have a scale, mode, or chord arpeggio to use, there are a lot of techniques that you could use. Emphasize the root note of the current chord. For modes, try playing every other note. This should map to the chord tones. Try to voice lead into the next chord. Before the next chord, play a note that is a half step or a whole step away from the next chord’s root. This will help lead into the next chord. It takes some practice to master, but it sounds great! Soloing is mostly about knowing what notes to play. We simplify the process by using scales, modes, and arpeggios. I recommend recording some chord progressions and practicing your improvisation. You can get some chord progression ideas from my chord progressions lesson. AP-010 How do I select scales for guitar solos? I play flute and yours has been the most helpful article in clearly directing me on the road to jazz soloing over chord changes. I’m at the point where I’m memorizing my major, minor, and pentatonic scales, so now I know how to apply them to the chord changes in songs which I practice. I could use an easy way to keep the different types of scales in my head – or do I just need to memorize the feeling of each scale type through their interval and sound? So major scale -this is easy – we’re so familiar with it. Do Re Me Fa So La Ti Do. Right? Pentatonic Major – it the song Someone to Watch Over Me – So I got that one. How do I keep straight the Minor scales without having to calculate from the 6th of the major scale? And so on. Thanks again. Mike, Thank you for your kind words. You ask a good question about learning by feel, interval, etc. A guitarist would most likely memorize a pattern because it is so easy to do. Since you’re flute player, I would learn to modify the major scale that you know. The natural minor scale (Aeolian mode) lowers the 3rd, 6th and 7th by a half step. C major scale has the notes C-D-E-F-G-A-B. C minor scale has the notes C-D-Eb-F-G-Ab-Bb. Of course, you could build it off the 6th degree of the major scale like you mentioned. I hope this helps. This would seem to be learning these through experimenting. Isn’t there some hard and soft rules about which notes or degree of the scale go with the current chord in the progression? To give you a few rules, chord tones always work well. If you’re playing the appropriate scale or mode that can be used to construct the chord (ex: C major over a C major chord, d minor or d dorian over a Dm7 chord) You can play the 1, 3, 5, 7 of the scale to get the chord tones. When playing major scales over major chords, the 4th often clashes because it is a half step from the major third. With minor scales over minor chords, the 4th sounds fine, but the 2nd clashes because it is now a half step from the minor 3rd. Half-step intervals from chord tones will create tension that clashes (not the best notes). Despite the clashing, tension and release can be used nicely. Some guitarists use it to setup a note that resolves (such as a chord tone). Tension and release is a practice that can create interest in your playing. For example, if you played C major 7 then played and F (the 4th of the C major scale) it would clash with the E in a C major chord. After playing the F, play and E and you will hear the tension resolve/release. Nice summary. When I was first learning to solo I tried to find a scale that would fit the key or progression. More recently, I’ve loved focusing on the pentatonic of each chord as they come. What’s cool is that if you do that for I-IV-V all those notes end up equal to the major scale of I, which circles back to the original concept. But thinking about it that way gets you out of playing rote patterns, and more about which note you are playing and/or leading into. I am trying to visualize both the pentatonic shape and chord shape at that particular part of the neck. That provides leaping off points for the half-step transitions you mention. Also, those same pentatonic shapes can be used for all of the minor chords that are diatonic to the key, the ii, iii and vi, where ii is the relative minor of IV, ii the relative minor of V and vi the relative minor of I. Skip the VII. This seems like a pretty reasonable system for learning the fretboard and for jamming. Maybe it does not work out as well if you start getting to differing 7th notes, but at some point you can just add in chromatic runs (2/b3/3/4/b5/5 and 6/b7/7/1). Would love your thoughts on further applications or exercises. A really great lesson. Though I have 1 thing that I cannot comprehend fully. What modal (ionion lydian etc) scales can you play over what chords? For instance you mentioned in your modes lesson and here that you play major and major 7 with Ionion and Lydian. Let’s say we are in C major scale, and we are playing C major chord followed by a F major forth, I-IV progression. Can I simply play Ionion for both, since they do have the same note, or should I play Ionion Followed by Lydian, or the other way around? Thanks a lot! Correction to my last sentence, “Can I simply play C Ionion for both, since they have the same notes, or should I play C ionion followed by F lydian, or I could do it in any order I want? Thanks mate! Thank you for your question. I’ll try to make this simple. You can play C ionion over both or switch it up because they’re the same notes. The difference is how you play those notes. For example, are you playing a lot of C notes or F notes over F major? The mode switch may help you play the F major notes more to highlight them. Usually, you’ll have a song that goes through a progression of chords in a given key. You want to identify those chord changes and play notes that compliment the current chord and lead into the next one. To do that modes help us shift our soloing thoughts as the chords change. This is important because we often play faster than we think. Thinking about a shift is easier than thinking about playing C but finding specific notes (though knowing the color notes is even better). If you play an F lydian or F ionion mode over an F major, you know the 1 3 and 5 of the mode uses the chord tones. If you play C ionian, you have to think that the F is the 4th so its chord tones are the 4 6 and 1 of the C ionian mode. That isn’t as simple as a mode shift. Similarly, D minor uses the 1 3 5 of the D dorian mode. This is easier to remember (for most) than the 2 4 6 of C ionian. Knowing how chords are built and their modal relationships helps you to know how modes can help you simplify your playing. That was a very helpful reply. Thanks. Now I get why modes are useful. Before, I couldn’t see the point of modes as they are all the same notes! It makes be think that the most important thing is to know the notes numbers for each mode and scale all over the fretboard so using he 1 3 5 7 notes can be used to guide improvisation. That means, for example, any note in the C scale can be 1-7 depending on which mode is best for the current chord. Isn’t that a lot of learning even for just one scale, and how would that best be approached? I recommend that you read my lesson on the Modes. It is more time-consuming than learning one scale, but it gives you more options. The guitarists who use them learn how to sound different from the guy who only plays pentatonics. I am a drum teacher in schools, and am re-learning all my college music theory stuff again. Thank you so much for this explination. I work with a lot of Classically trained people, who don’t know about rock.blues,jazz etc. So consiquently I can’t really talk to them about ‘Music’. Now we can begin to communicate !!! thanks again, best of luck.. Thank you for your kind words. Good luck with your learning and your teaching! I’m fairly new to using modes in my solo work, and for about 20 years have been just “winging it” within a scale that I sort of made up… with decent results strangely enough, but also very limited, in tone and interest. For the record, I have been a “by ear” player all my life, and had limited theory. I recently set out to expand my knowledge and began to learn about modes and other scales, and worked hard to memorize all 7 patterns, along with the 7 Pentatonics that are connected to these. Turns out, my made up scale is just pieces from 3 separately linked Pentatonic scales. I found that memorizing all 7 mode patterns (and relative pentatonics), and knowing them forward backward, and practicing them going up one and down the other for interconnected scales, will help you with the concept that they are all just one great big scale called the Diotonic scale. Once you know this, you can find a combination of notes that sounds good, either over the key or each chord individually, and then apply the scale that best suits the pattern of notes you just played. 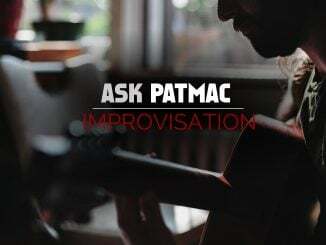 This will fairly quickly lead you into a pattern that fits, and then you can alternate between Pentatonic and modal scales within the whole big picture to make things a bit interesting. It may take a few trials before you lock into the right mode, for example. Mixylodian and Dorion may share some similarities, or Mixolydian and Lydian. I’m still mastering this, but the more I practice, especially with a looping pedal, over random chord progressions, I am getting much more efficient at this. Food for thaught for the non-technical guys out there. Thank you for providing your perspective. I’m sure it will be helpful to some readers! Sometimes you can play a couple different scales that differ by a note or two. If you “combine those scales” you can come up with a set of notes that works really well. Sometimes I like to switch between major and minor pentatonic scales and throw in the “blue” note from the blues scale. On occasion I add in a note from the Dorian or Mixolydian mode. I’ve been meaning to do a lesson on this because it has some practical benefits. Great lesson. Maria Elena by Los Indio Trabajaras has some beautiful embelishments between the phrasing of the melody. Would these be like chord tones of the mode that is being played? Thank you for the comment. It is hard to know without pointing to a specific embellishment. In general, embellishments are not limited to chord tones.